April 28, 2014 Daniel G.
Most people spend four to six hours a week in their home’s designated laundry area, and not many of them get much enjoyment out of it. Not that doing laundry should infuse you with the same excitement as watching the Super Bowl, but by putting a little thought into how your laundry room is arranged, you might at least get a sense of peace and accomplishment on laundry days. Too often the area devoted to laundry activities appears to be more of an afterthought than a planned space. “Here’s a water hook-up, so let’s put the machines in that corner” sometimes is about all that goes into establishing a laundry room. But doing laundry involves a lot more than a washer and dryer. There are all the soaps, fabric softeners, stain removers, bleach, scrubbers and sponges that needs to be stored. Flat space is necessary for folding items before they become wrinkled. A sink is always a good idea. Room for an ironing board would be nice. Home designers today are putting a lot of thought into creating ideal laundry areas. Gone are the days when a couple of pipes and an electrical outlet on the blueprint meant a washer and dryer will fit there. 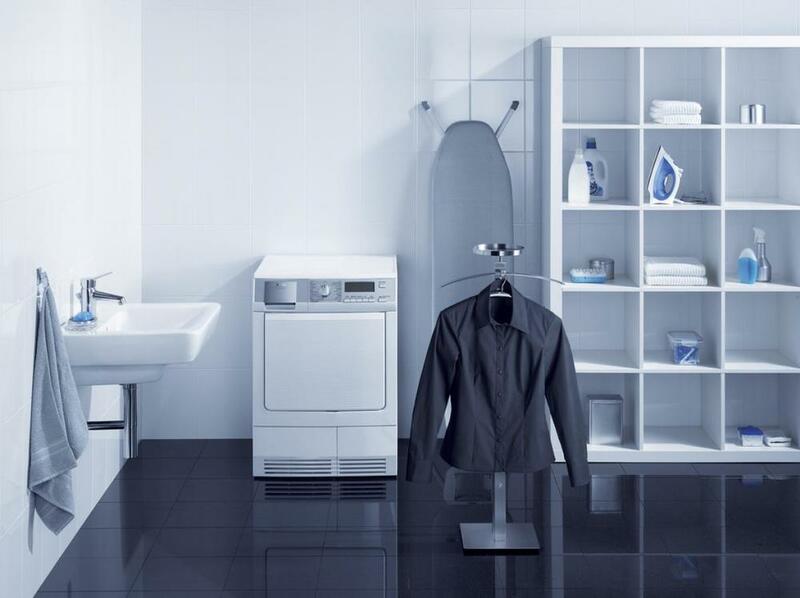 These days, laundry rooms are being designed with function and convenience in mind. That means efficient shelving and cabinets, folding tables (including the pull-down variety) and sinks. If this doesn’t describe your current laundry room setup, don’t panic. You can easily accomplish a minor facelift on your own, and there are plenty of remodeling contractors who can perform a complete overhaul of your laundry facilities. A good place to start when determining what needs to be done is to zero in on what the problems are. If your laundry area consists of nothing more than a washer and dryer crammed together between walls in a tight space, get creative and figure out how to open that space up. It may require moving a wall or removing a wall and building another. If items such as a bookcase, hutch, furniture, etc., are encroaching on your laundry space, find a new place for these items. You’ll feel much better working in an area where you can move about at ease. A lack of storage shelves and cabinets means bottles and boxes of laundry accessories end up stacked one on top of the other or spread around the area’s perimeter on the floor. Look around your area. Is there space on the wall for one or more cabinets? Could a long shelf go below them? If you have a bookcase you’re no longer using, you could turn it into a great storage area. A plumbing contractor can install a sink in the ideal size and with the specific amenities you want. If you’re not comfortable with plumbing, it’s best to hire a professional for this work. Laundry rooms with plenty of stacking and folding space are a breeze to work in. If a large table won’t fit in your area, consider installing a fold-out table mounted on a wall. Beyond folding clothes, flat space gives you a convenient place to set laundry baskets and whatever you might be carrying like a purse, cell phone or sunglasses. You may determine that the area that houses your laundry equipment simply is in the wrong location within your home. If there is simply no efficient way of adding space or shelving or other amenities – or if the location is highly inconvenient – think about a brand new laundry area, built to your specifications with the features you want and in a good location. An experienced contractor can produce exactly what you’re looking for. I hope these ideas are helpful if your laundry area needs improving. Like with any other area in the home, the key to an efficient laundry room is having space to move and being able to easily find and use the things you need.